Trying to get the deed from this widow in Gnisis is just the start. Speak to Darius in Gnisis for duties. Go west to Widow Vabdas's hut and talk to her. Find the Ghost of Vabas's husband, and take Lugrub's Axe. 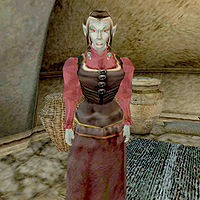 General Darius at the Madach Tradehouse in Gnisis will ask you to retrieve a land deed from the Widow Vabdas, whose husband died recently in the Gnisis Eggmine. The General wants Vabdas' land for a new dock and tells you not to take 'no' for an answer. Check around town to learn that the Widow Vabdas lives in a hut west of town. If you talk to her about the deed she will refuse to give it to you. Instead, she says that her husband was murdered by a legionnaire when he went to the closed mine and she wants you to find out what happened. Head for the mine on the east side of town on the hill and speak to the guard Vatollia Apo. Since you're in the Legion he will give you a key to the mine without the need for a high disposition. Note that you must be wearing Imperial armor for this, otherwise talking to him just lowers his disposition by 5. The first area of the mine doesn't have much to it, though you'll find an aggressive Orc (Lugrub gro-Ogdum) in the Lower area who will attack unless you leave the area quickly enough. Also in this area, you will see a Kwama Queen. Be careful not to kill her as she needs to be alive for Darius' next quest. Explore the lower mines until you find the ghost of Mansilamat Vabdas in the underground stream. It will tell you that Lugrub killed him to hide the fact that he was sleeping on the job when Vabdas entered. As evidence, he directs you to the broken axe (Lugrub's Axe) at the bottom of the pool nearby. Return to Darius with the proof of the murder. Give him the axe and his disposition will increase by 3 and he will tell you to go and kill Lugrub. Do so and report back to Darius who will reward you with an Imperial Broadsword. If you talk to Darius about the deed afterwards, it will turn out that the Legion has started a donation fund for the widow, to which you can contribute if you want. Alternatively, the investigation can be skipped by stealing the land deed, which is found in a locked chest on your right as you enter Widow Vabdas' house. The Widow holds its key. If you present the stolen deed to Darius you still receive the sword and reputation award, but his disposition increase is only 10. Killing Lugrub before starting this mission does not have any negative consequences. After Darius orders you to kill Lugrub, simply mention "land deed" to him again and you will complete the mission and receive an Imperial Broadsword. Each time you mention the ghost to Darius, before mentioning the axe, his disposition will decrease by 2. If you are not Imperial Legion, there's no quest for you, but you can get into to the mine with no key by using the back entrance at the river, soultrap Mansilamat Vabdas ghost (a nominal value of 56000, and requires a Grand Soul Gem), fight Lugrub and loot him, then wend your way to the egg mine's front door, or go back out the way you came. Neither Darius nor Widow Vabdas have any dialogue for you relating to Mansilamat or Lugrub. You can also get a key if you have a pickaxe in your inventory while talking to Vatollia Apo. Talking to Oritius Maro about the Talos Cult will start the Talos Cult Conspiracy quest prematurely. Since you're required to give proof in both instances, Darius keeps asking for proof of the cult's conspiracy against the Emperor, effectively keeping you from ever completing this quest. 10 General Darius of the Imperial Legion has asked me to get the deed to the Widow Vabdas' land. 30 The Widow Vabdas accused the Imperial Legion of murdering her husband. She refused to give me the deed to her land. 40 The Widow Vabdas told me that her husband was last seen in the Gnisis Eggmine. 50 The ghost of Mansilamat Vabdas told me that he was murdered by Lugrub gro-Ogdum, a Legionnaire. Mansilamat Vabdas' corpse and the Axe that was used to murder him lie nearby underwater. 70 I brought the Axe to Darius. He believed my testimony and ordered me to bring justice to the Widow Vabdas by slaying Lugrub gro-Ogdum. This page was last modified on 7 August 2017, at 21:54.